The Stephen Carey Fund are delighted to announce that they have joined forces with the Hexham Courant to launch a new campaign to raise funds to install more Public Access Defibrillators within the Tyne Valley. Bill and Barbara Brook hand over cheque for £2,000 to Dougie McEwan. The Stephen Carey Fund, like many locals and visitors alike, are not immune to the pleasures of a Sunday afternoon drive across the county. For the committee members David Wilson and Dougie McEwan their drive last weekend took them to sunny Bamburgh to meet representatives of the local community Bill and Barbara Brooks. 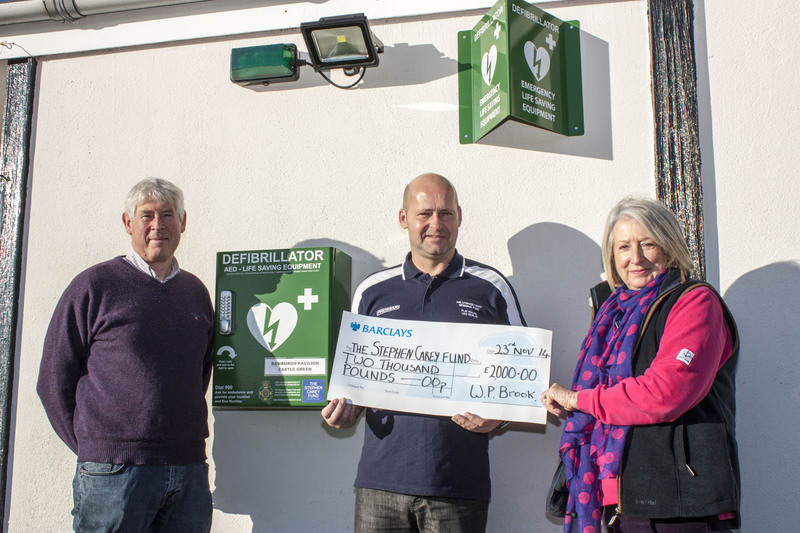 Several months ago Barbara, a Parish Councillor for the village, made contact with the fund to make enquiries about getting a defibrillator for the community. 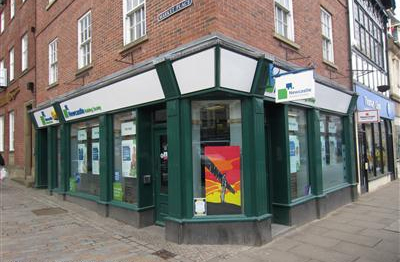 A few phone calls and a meeting later and their fundraising efforts began in earnest. Local businesses generated donations of £500 and two talks provided voluntarily by Graham Bell, Chairman of the North Northumberland Bird Club, brought the total to the £1,000 needed to secure the package. What the fund committee weren’t aware of as they made their journey on Sunday is that a further donation of £1,000 had been made by the family of the late Mr Christopher Peace. Mr Peace loved Northumberland and particularly Bamburgh and his family had been in touch with the Parish Council with a view to make a donation to a local project and when they heard about the fundraising efforts towards a community defibrillator they agreed immediately that Christopher would have been delighted with their choice. The unit was the first device sited in the village but was quickly followed by a second defibrillator at the north end of the settlement (funded via efforts of another group) much to the benefit of the local community and visitors to the area. The Stephen Carey Fund are delighted to announce an informal partnership with local financial company SPORTSassist. 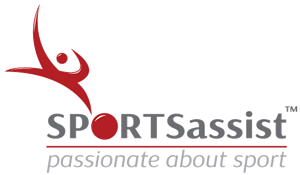 The arrangement will see SPORTSassist offer free no obligation financial reviews for the supporters of the charity. In return The Stephen Carey Fund will be eligible for donations. Communications Manager for the fund, David Wilson, said “We received the approach from SPORTSassist and were obviously interested as we are keen to develop new fundraising avenues but also keen to ensure we looked after the interests of our supporters”. SPORTSassist have confirmed that they are offering to make a donation of £50 on your behalf in return for you agreeing to a Full Financial or Pension Review. All referrals and quotations are on a ‘no obligation’ basis and of course you should always look to the wider market to ensure you have found the best deal for you. SPORTSassist have helped many organisations across the country raise funds for various purposes, indeed they have worked with Alnmouth FC (the village football team which Stephen played for). If you would like to find out more please visit their website. 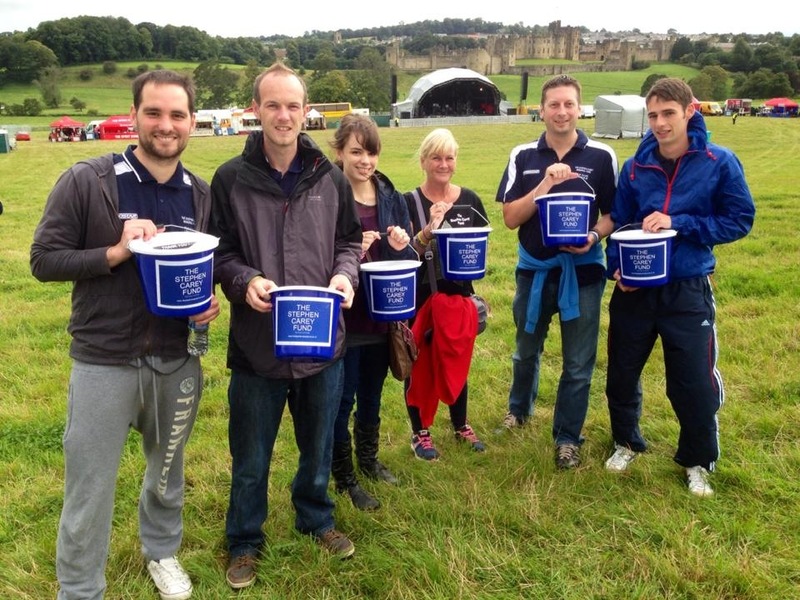 The committee of The Stephen Carey Fund ventured onto the green fields near Alnwick Castle at the weekend as invited guests of the Northumberland Gazette. As this years Jam Jar Army beneficiaries we had the honour of being able to shake our buckets at all of the lucky people who attended the Simple Minds concert held at The Pastures on Saturday evening. Despite a blustery wind which was later joined by rain the weather couldn’t dampen the spirits of those attending and it certainly didn’t dampen their generousity as we are happy to announce that a total of £605 was raised on the evening. The committee from the fund would like to thank the KAL Music and the Northumberland Gazette for their permission to collect at the event and absolutely all those who dug deep with their donations. 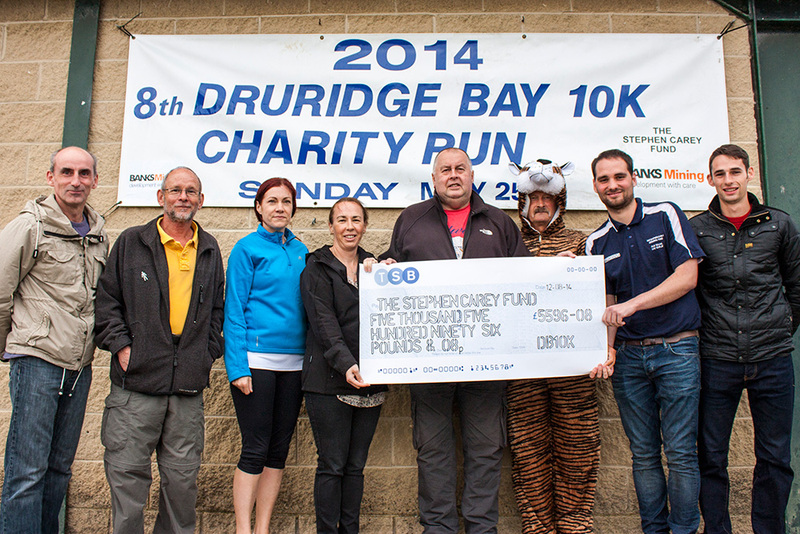 In late May approximately four hundred people of all athletic abilities took park in the Druridge Bay 10k 2014. The Stephen Carey Fund, were the selected charity for this event and following the collection of all donations and sponsorship the committee of the event were delighted to hand over a cheque for the sum of £5,596.08. Chairman of The Stephen Carey Fund, Scott McEwan, said “From the minute we first heard that we had been selected as the beneficiaries, through the various meetings, the event itself right up to the handover of the donation it has been nothing but an absolute pleasure to be involved with the committee and support team who organise this event. I can assure all those involved and who took part on the day that we will put this donation to effective use within local communities”. The Stephen Carey Fund are delighted to announce that a major civil engineering company have selected our cause as recipients of a substantial donation. FP McCann operate throughout the United Kingdom providing a range of services but will be known in Northumberland for the provision of pre-cast concrete pipes from their site near Howick. The team at FP McCann at Littlehoughton were asked to put forward suggestions for good causes as part of the organisations charitable efforts. 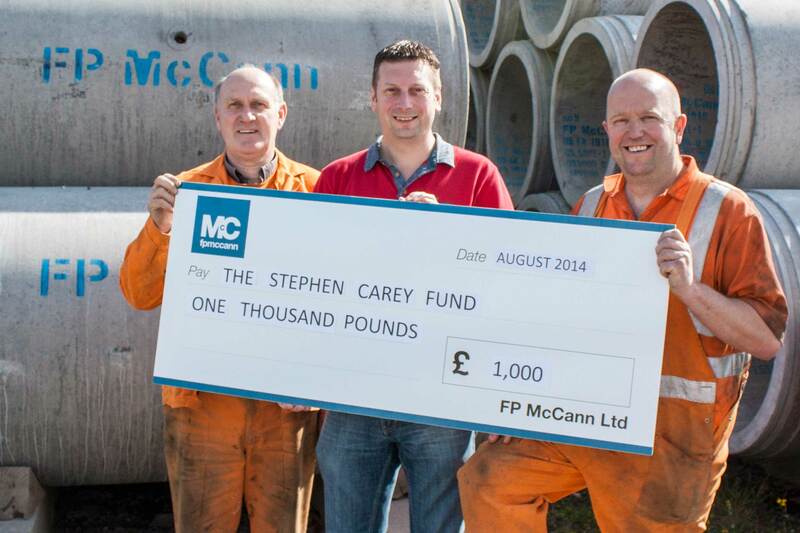 As a result The Stephen Carey Fund are now in receipt of £1,000 from FP McCann. Our thanks obviously go out initially to the team at Littlehoughton for their nomination and then secondly to FP McCann for seeing the value in our efforts and selecting us for the award. Upon learning about the donation the committee of fund held a meeting to discuss the award and with the full support of FP McCann have subsequently announced that they are to match the donation and are now in discussions with representatives from Embleton Parish Council who will soon have their own Public Access Defibrillator courtesy of this generous donation.